Yesterday was six months to the day since Summer died. My heart has ached so much over the last six months that sometimes I don’t think I can bear it. Mostly, I have no idea when, or if, this sadness will ever leave me. I have no experience with grief like this. But yesterday I saw something that gave me hope. It was a rose bush. This is a bush I thought I had eliminated six years ago. 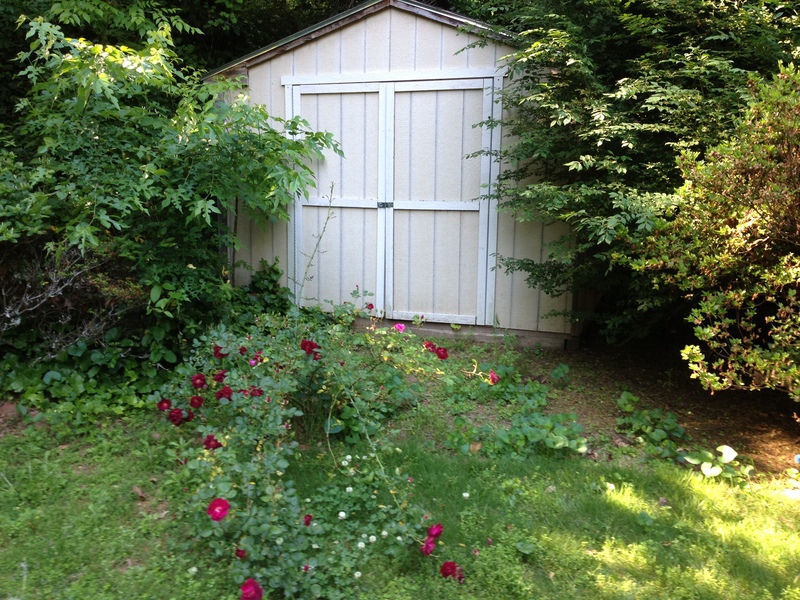 I had had a shed built in my backyard, and this rose bush was in the way — just a few feet from the new front door. I decided that it had to go. I cut it down to within an inch from the ground and covered the area with pine straw. I never gave the rose bush another thought. 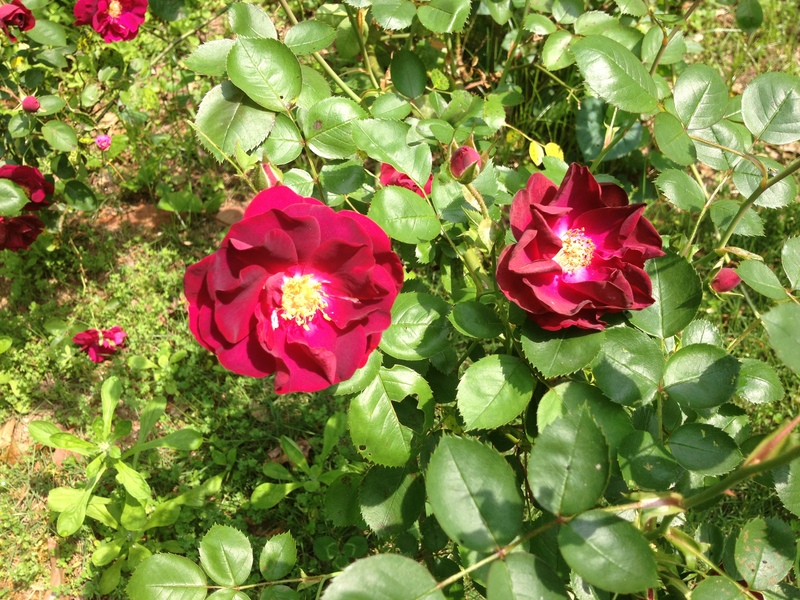 So you can imagine my surprise yesterday when I noticed that the rose bush was back – in a big way. Stretching out into the yard, it was full of deep red flowers. I thought about how slowly it must have grown back, inching toward the sun, reaching out a tiny bit every day. Progress so slow that it had escaped my notice. And somehow, that rose bush made me think of my heart, which feels like it has been cut down to within an inch of its life. Maybe, like the rose bush, my heart will grow back, too. Maybe with time – with grace – it, too, will bloom again. Perhaps that’s just how the universe works — constantly recreating and discovering itself — and I am no exception. Perhaps my heart will heal as surely and naturally as the beautiful rose bush in my backyard. On this Mother’s Day, I think of you (I’ve been following Summer’s blog for some time) and all mothers (myself included) who have lost a child for whatever reason. It’s been 20 years since I lost my twins due to serious birth defects. Does the pain go away, never. Summer was an amazing young woman. She found a way to bloom beyond her own pain and suffering and I believe you will too. So, while it may seem to others, rude to say, I’m saying it anyway…Happy Mother’s Day. I pray your heart will find the sunlight beyond your pain and grief. Oh, Lynne, I hate the pain you’re going through, but know it’s only because you love so much, and I love this story. It makes my heart smile, and I know Summer is smiling too. Lynne: I wish I had gotten in touch with you before this but I fear I was too emotional to do so in any way that would have been helpful. I know Merle has been in touch. Your loss has to be unendurable, and I can only imagine the pain you have had. I am so glad that something as simple as a rose bush has given you a little warmth and hope that you will recover. Life can be brutal sometimes, and although it is a cliche to say so, it does go on. I know from the experience of others that the sorrow over loss of a child never truly goes away, but time and remembering the good times will lessen the hurt. I followed her story and was heartsick. I am really, really sorry about Summer and want to wish you the very best. I pray that this reply helps you and does not add to your grief. I just want to let you know that I pray everyday for Summer. I always think of her. I have been have a hard time for a while. It is a reallly long story. But I just want to let you know that Summer is my inspiration and she keeps me pushing through. Remember you can’t have a rainbow without a little rain. Hope all is well sending all my love.